The ability to solve increasingly difficult problems through simple means is a trait that all web developers should cultivate. I absolutely love creative people, those that have an ability to think outside the box. Those who can take an extremely difficult problem and solve it with a very simple answer. I saw this image and had to post it, because it portrays this idea perfectly. Now I'm not advocating the destruction of United States currency. I am advocating the use of common sense. I have a friend, Jared, that is absolutely amazing when it comes to common sense. I worked with him for a while when I lived in Korea. There were countless times where I would come up with what seemed to be an extremely difficult problem, but every time he would say, "Well why don't we do [simple answer to terribly difficult question] then." I would just look at him and think to myself, wow... that would work. 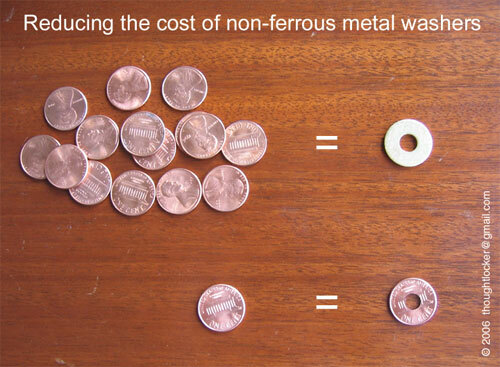 (just like drilling a hole through the penny). Unfortunately there isn't a school for common sense. You either have it or you don't. The same can be said of good programmers. Good programmers can see and understand the "whole picture". You can't be told how to "understand" a project, you just have to have cultivate the ability to take a complex problem and break it down into its simple components. Working with and studying the methods of people that have this ability to "understand" can help you learn little by little how to do what they do instinctively. Study other people's code. See what they do well and what you would change to make it better. Always keep learning. So the next time you come across a problem that leaves you scratching your head, see if there is a simple answer that you simply overlooked.